What does end of support mean to our customers? Update, October 2016: One customer in the Northeast US just told us that they have a Printronix Service Contract on their IBM 6400 units, and it took the Printronix Service folks over a week to find the part, get on site and repair the printer. Why are IBM 6400 customers affected by this end of support announcement ? RPPS maintenance service will suffer. Repairs from now on will have to use pulled parts inventory from used machines, and MTBF Mean Time Between Failure will now suffer. RPPS will still write a contract, as they will on these ancient IBM machines – 3211, 3262, 6262, 6252, 5262, 4245, but new parts have not been manufactured (some for decades), they are replacing old broken parts with old seems-good parts with no idea how long those may work until another failure. 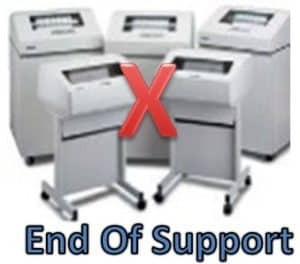 We have great replacement options for you with your Printronix P5000 or IBM 6400 line printers. Fill out our Contact Us Form. Let us help you analyze your current and future print needs (even considering your other printers that may not be going “end of support”). Click Here to check out the Printronix P8000. In addition to sending you information on new Printronix P8000 line printer options, we will contact you to discuss your company and application objectives and the printer product plan that will work best for your business.